In the Highland of Ecuador, Shanin (Petunia violacea) was reportedly utilized as an entheogen. Chemical investigations have been unable to determine it's active principle. Novel diterpenes were found in the closely related Petunia patagonica and several ketones are known to occur in the genus. Indians of Ecuador report feelings of levitation and soaring through the air. Our shanin was organically grown in Argentina. Vigorous, spreading annual with a profusion of small, fragrant, violet-colored flowers. Great heat tolerance for a petunia. One of the parents of all modern Petunias is Petunia violacea, a native of South America. Petunia violacea is heat tolerant, low spreading and known for a profusion of violet flowers. Unfortunately, the flowers are smaller than modern hybrid flowers and are not considered to have great ornamental value. In 1993 Greg Grant observed Petunia violacea at a horticulture exposition in Stuttgart, Germany. Grant, a former Director of Product Development for Color Spot Growers, and now a lecturer at Stephen F. Austin University, recognized the potential of this Petunia and brought three seeds back to Texas. However, only one of the seeds germinated and produced a plant. From that one plant and through the efforts of Grant and Dr. Jerry Parsons, Extension Horticulturist for the Texas Agriculture Service, came the commercially available V.I.P. Petunia, an acronym for "Very Important Petunia" or "Violet in Profusion." Laura Bush Petunia is an offspring of the V.I.P. Petunia that was named by Greg Grant as a plant release of Stephen F. Austin University. V.I.P. Petunias are trailing Petunias, ideal for hanging baskets. They are practically sterile which means that they bloom continuously throughout summer. They prefer full sun, but tolerate moderate shade if they have a minimum of seven hours of direct sun. 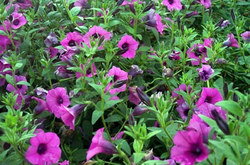 The ‘Laura Bush’ Petunia has the same special qualities of its ‘mother’, but has larger blooms and is more cold tolerant.